Russian art collector Aleksandr Khochinsky stands next to what Poland believes is the 18th-century painting Girl With A Dove. RFE/RL Copyright (c) 2015. RFE/RL, Inc. Reprinted with the permission of Radio Free Europe/Radio Liberty, 1201 Connecticut Ave., N.W. Washington DC 20036. 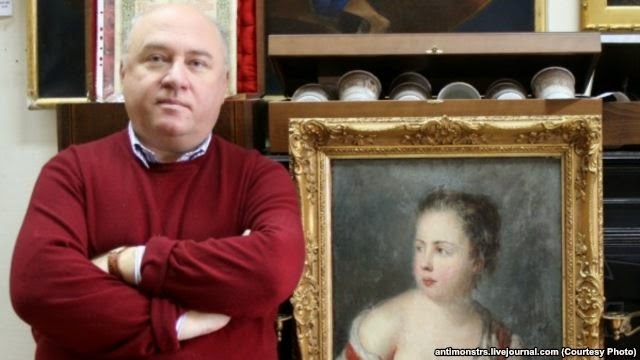 WASHINGTON -- U.S. authorities have arrested a Russian art dealer at the request of Poland, which accuses him of harboring an 18th-century painting “plundered” during World War II both by Nazi Germany and the Soviet Army. Aleksandr Khochinsky, who made global headlines in 2006 by purchasing letters from French philosopher Voltaire to Russian Empress Catherine the Great, says U.S. federal agents acting on a Polish extradition request arrested him at around 6 a.m. on February 26 at his apartment in lower Manhattan. “[They] took me outside into a record New York cold snap while I was wearing my slippers,” Khochinsky, 64, said in a March 9 telephone interview hours after being released from jail under house arrest. Justice Department spokesman Peter Carr confirmed that Khochinsky was arrested by U.S. authorities at Poland’s request. He did not provide further details. The Polish government claims Khochinsky is in illegal possession of Girl With A Dove, a 1754 oil-on-canvas by French-born Prussian court painter Antoine Pesne. The painting, one of hundreds of thousands of cultural objects believed to have been plundered from Poland by German and Soviet forces during World War II, is among some 63,000 such “lost” pieces that have been catalogued by the Polish Culture Ministry. Under Polish law, the illegal acquisition, sale, or concealment of property “of significant cultural value” is punishable by up to 10 years in prison. Poland’s Ministry of Culture told RFE/RL in an e-mail that it is cooperating with representatives of the U.S. Federal Bureau of Investigation (FBI) in Poland in its bid return the painting, which was purchased in 1931 by the Wielkopolska Museum in the western Polish city of Poznan. In 1943, the painting was removed “together with the most valuable works from the museum” by the Germans and “transported to the depths of the Third Reich, where in large part they were seized by units of the Red Army,” the ministry added. Khochinsky, a U.S. resident who has lived in New York since 2009, does not deny that the painting is in his possession. He says his father likely brought it home “from the front” after fighting for the Soviet Army during World War II. Khochinsky, who accuses Warsaw of rebuffing his efforts to negotiate a deal to repatriate the painting, says he inherited the painting after his father died in 1991 and that it is currently in Moscow. Khochinsky, who is wearing an electronic monitoring bracelet while under house arrest, said the next hearing in his case is scheduled for May 5. The standoff dates back to 2010, when Khochinsky, whose wife owns the Bogema antique salon in central Moscow, says he discovered by chance that the Polish government was searching for Girl With A Dove. Khochinsky says he contacted the Polish diplomats in Moscow and informed them that his painting may be the one their government is searching for. He offered to hand it over in exchange for Polish real estate that he says belonged to his mother prior to World War II. He says his mother, a native of Przemysl in southeastern Poland, fled eastward from the Soviet-controlled city as German forces advanced during the war. The rest of her family died in the Holocaust, Khochinsky says. Noting the international criticism Poland has faced for “failure” to properly compensate Jewish victims and their descendants for property seized under Nazi occupation and the postwar communist regime, Khochinsky says the swap would be a fair deal. But the proposal went nowhere. In July 2010, Poland sent Piotr Michalowski, curator of the European paintings gallery at the National Museum in Poznan, to examine the painting in Moscow. He concluded it was an original. “I found a signature on this painting, [an] original signature of this Antoine Pesne, with [a] date and everything,” Michalowski told RFE/RL. Khochinsky says Michalowski failed to conduct a series of tests necessary to determine the work’s authenticity and that the Polish expert’s conclusion cannot be considered definitive. Communication between the two sides subsequently broke down. Poland’s Culture Ministry says Khochinsky failed to respond after it delivered a restitution claim to him through the Polish Embassy in Moscow in February 2011 -- an assertion the collector denies. The ministry then asked regional prosecutors in Warsaw to seek international legal assistance to recover the painting. Khochinsky says he had heard nothing from Poland about the painting for two years when U.S. federal agents showed up at his apartment on February 26. He adds that the issue of the painting’s restitution is not in his control. An estimated 516,000 items of cultural property were taken from Poland during German and Soviet occupation, making it “undoubtedly the country which suffered the most from the looting of cultural goods during the Second World War,” said Vanessa von Kolpinski, a researcher at the London-based Art Loss Register, a commercial firm that tracks lost and stolen cultural artifacts. The National Museum in Poznan is eager to secure the return of Girl With A Dove because it was the only painting by Pesne in its collection prior to World War I, and because it is a departure from typical examples of the artist’s work, Michalowski told RFE/RL. “He painted mostly portraits, official portraits, and this one is a genre subject. So it’s more interesting in my opinion,” he said. Khochinsky said Poland would know nothing about the whereabouts of the painting if he had not contacted Polish officials in 2010. “They got everything from me. They never had any information of their own,” he said. He added that in his first hearing at the U.S. District Court for the Southern District of New York, Judge Jed Rakoff expressed “harsh doubts” about the basis for Poland’s extradition request. U.S. prosecutors in the case could not immediately be reached for comment. The case is not the first time Khochinsky has found himself entangled in international intrigue. In 2006, he paid 583,200 euros at a Sotheby’s auction in Paris for 26 letters that Voltaire wrote to Catherine the Great between 1768 to 1777. At the time Khochinsky declined to identify for whom he made the purchase. But three years later he told The New York Times that he bought the letters for a Russian billionaire who intended to present them as a gift to Russian President Vladimir Putin. Khochinsky claimed he gave the letters to Russia’s state-owned Channel One television, which he said was planning to televise their handover to the Russian leader. But the documents subsequently vanished. Khochinsky has accused Channel One director Konstantin Ernst of involvement in the alleged disappearance of the letters, an allegation Ernst has denied. A spokesman for Putin said the Russian president "never saw these letters, and nobody ever gave him anything like this, or will give it to him,” according to the Times report.